Pashley Cycles is England's longest established bicycle manufacturer. Founded in 1926 and based in Stratford-upon-Avon, their dedicated team design and hand-build a unique range of traditional bicycles and tricycles. From their flagship traditional Princess and Roadster models to the exclusive Guvnor Path Racer, every one of their bicycles is built to exacting standards. The range includes classic and commuter bikes and retro beach cruisers, as well as adult and children's tricycles that provide stability and pleasure on three wheels. Pashley also supplies high-quality carrier cycles, cargo bikes and load carrier tricycles for industrial and commercial use, offering companies an economical and environmentally friendly alternative for transporting food and equipment, vending, or delivering post. Every Pashley bicycle is unique from the moment it leaves the workshop in Stratford-upon-Avon. Each one is hand-built to order by a team of dedicated and experienced craftsmen, who are committed to continuing the tradition of high-grade, skilled British manufacture. Pashley tricycles open up the delights of the world of cycling. 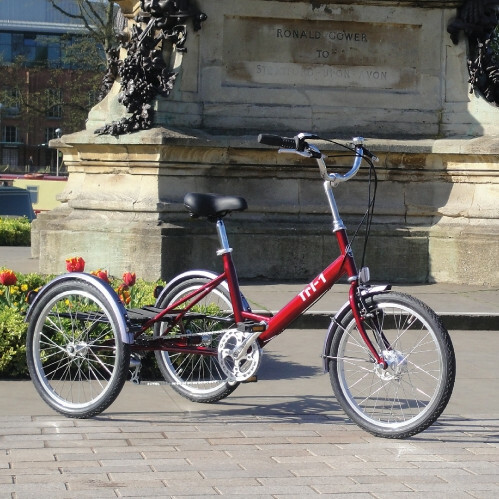 The combination of a classic three-wheeled design and Pashley's time-honoured British build quality allows you to ride in the utmost comfort and with the security of knowing that your tricycle can be relied on to stand up to the rigours of everyday use. Pashley has become a world-leading manufacturer of bicycles and tricycles for industrial and commercial use. Pashley Carrier Cycles (also known as cargo cycles, work bikes, delivery or utility bikes) are purpose-built to help you move people, packages and goods quickly and safely throughout the working day.